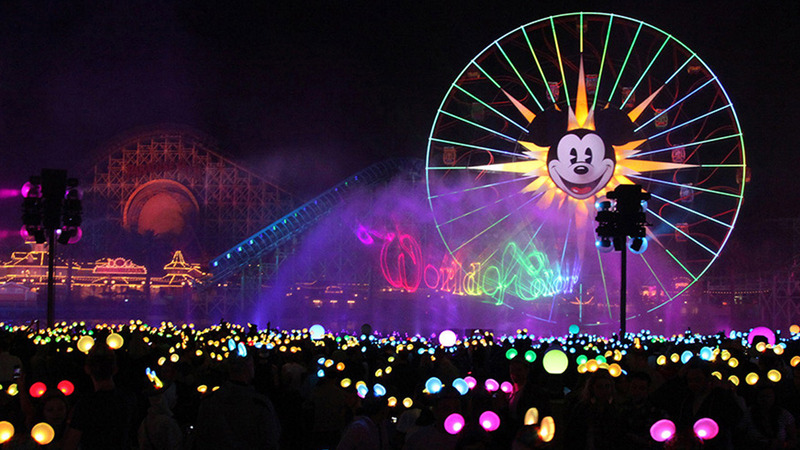 File image of the new "World of Color" show that debuted in May 2015 as part of Disneyland's 60-year diamond anniversary celebration. ANAHEIM, Calif. -- Disneyland and Disney California Adventure have installed metal detectors at park entrances, added extra police patrols, discontinued the sale of toy guns and banned people 14 years and older from wearing costumes or masks due to security concerns. Visitors will be randomly selected to go through portable metal detectors after having their bags searched at park entrances. Spokeswoman Suzi Brown said Disney has increased the presence of police officers and specially-trained dogs at their parks over the past few weeks. The new safety protocols are also being implemented at Walt Disney World in Orlando. "We continually review our comprehensive approach to security and are implementing additional security measures, as appropriate," Brown said in a statement released Thursday. Universal Studios Hollywood is also testing metal detection at their theme park. "We want our guests to feel safe when they come here. We've long used metal detection for special events, such as Halloween Horror Nights," spokeswoman Audrey Eig said. "This test is a natural progression for us as we study best practices for security in today's world." Officials at SeaWorld San Diego said they are also stepping up security during the holiday season, but would not provide specifics.